The beautiful reward at the end of the trail! Worth the wet feet! 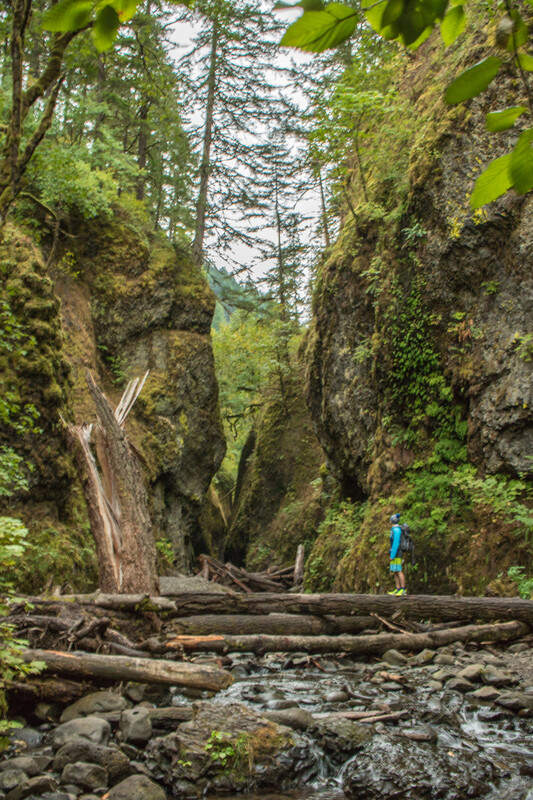 TL;DR: Oneonta Gorge is insanely beautiful, but you’re going to get pretty wet on this hike (it is up a riverbed), however the experience is 100% worth it. 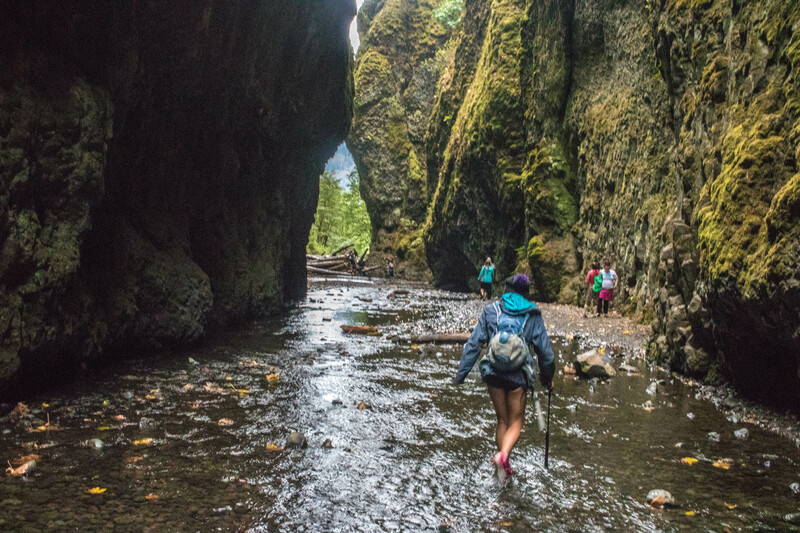 Go early to avoid the crowds; wear a bathing suit/clothes you don’t mind getting wet. 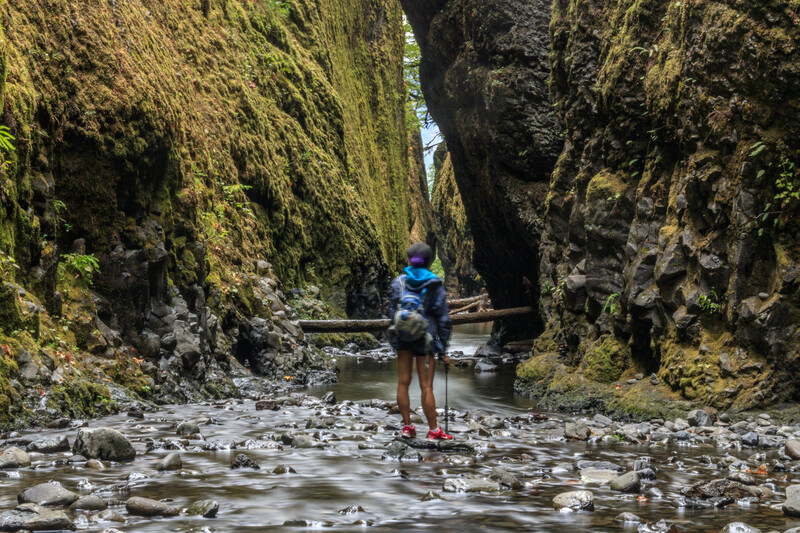 Heading into the Columbia Gorge area, we’d heard lots of great things about the Oneonta Gorge hike. We’d heard rumours of huge traffic jams if you arrive after breakfast, so we made sure to get there just after sunrise. 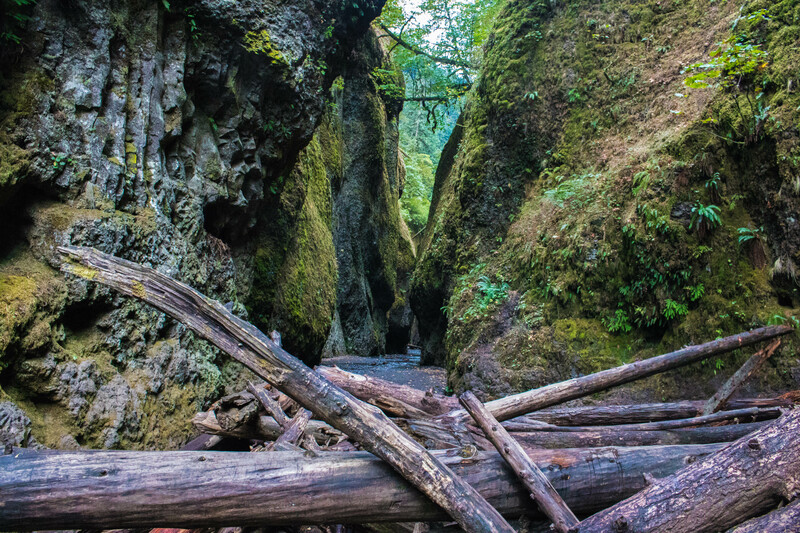 Arriving in the Gorge area, the Oneonta Gorge hike was pretty straightforward to find. If you’re arriving from the east, you should see a big tunnel to the left of the road carved into the rock and a carpark just after. The hike starts in the riverbed between the two. There’s limited parking at the side of the road; so, another reason to start early. Once you’ve descended down to the river, the path is pretty obvious. 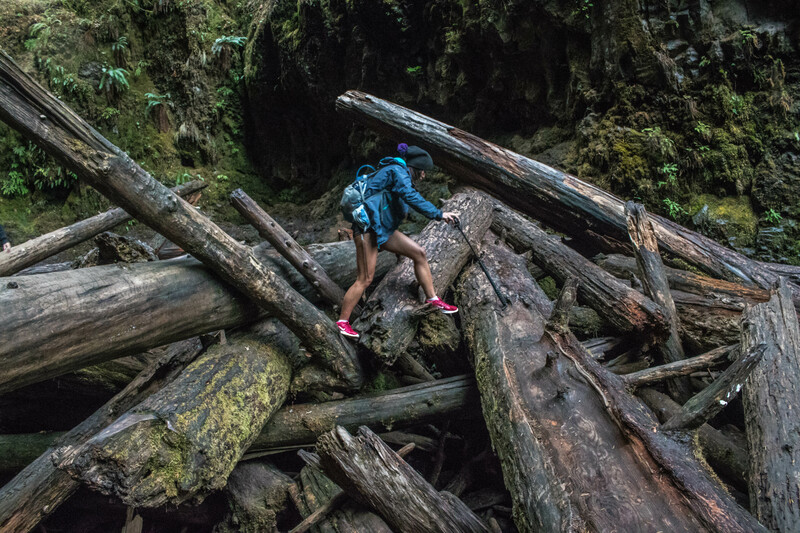 You’ll come up to an enormous log jam (giant pile of trees), which we carefully scaled (the logs were wet and slippery, take care and only go for it if it’s within your capabilities), and it is at this point that the gorge starts in earnest. Hurdle the trees to enter the Gorge! As the hike is almost zero incline and short, we decided to wear our bathing suits and wear old trainers that we didn’t mind getting wet. After I’d cleared the logjam I decided to switch to flip flops as the water seemed pretty shallow the whole way. It made wading a little trickier but I’m glad I kept my shoes dry! We’re told the water depth varies throughout the year, so don’t take our word for it. We slowly meandered our way up the gorge, taking in the unique setting, and quietly thanked ourselves for getting up so early. 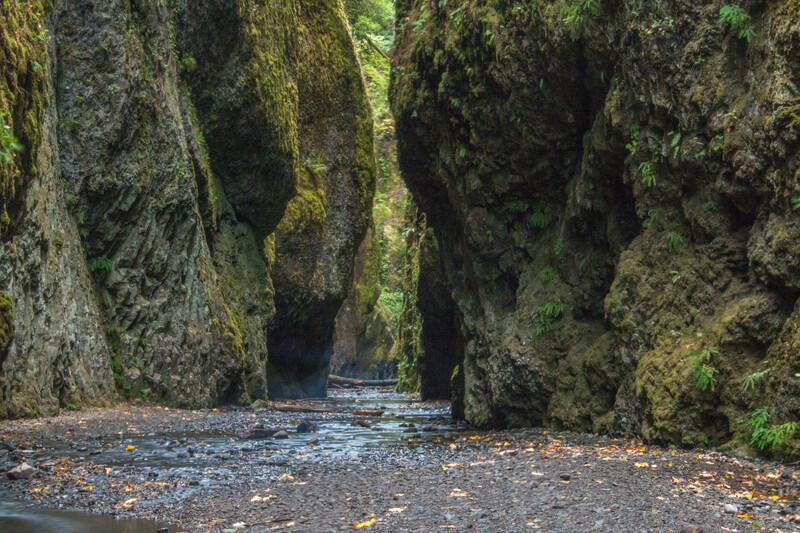 We more or less had the whole gorge to ourselves as the sun rose, and we would definitely recommend opting to skip breakfast to get the same experience. You can’t avoid getting wet feet on this one! So far so good; not too wet, and enjoying the amazing scenery! This place is a photographer’s dream! Then, just as you think you’re going to get out without more than damp shoes, and just as the final waterfall is in sight, the water gets a lot deeper for about 5-10m. I’m 6’3″, and I would say the (cold) water got to slightly above my waist (maybe 3ft deep). 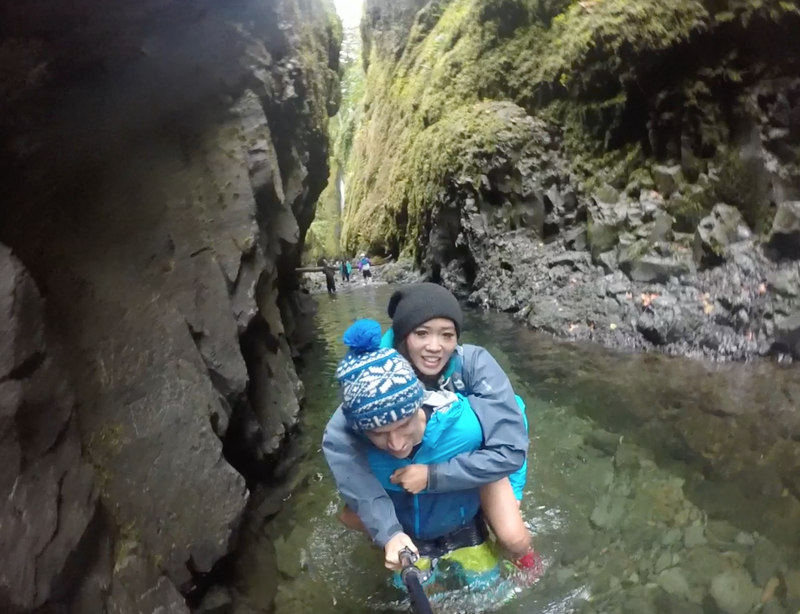 Fortunately I was tall enough to piggback Lou over the water along with the rest of our stuff! Getting wet was a small price to pay for what was up ahead though! On the way back we saw a couple wearing waders.. very good call if you have them! Once you’ve emerged on the other side, you’ve made it to the final waterfall, surrounded by beautiful green moss on all sides. Definitely worth getting wet for. Seeing as we were already wet, we even took a bit of a dip in the pool under the waterfall. Not for the faint hearted! Now all that stood in the way between us and a hot chocolate was the same walk back in reverse. Sorry, there’s no secret dry escape route. Cue another piggyback. Not even 9 a.m. and already getting busy! It was at this point that we saw how true the rumours about the crowds were. The walk back was much busier, and this was just before 9am. We’d heard rumours of traffic jams of hundreds of people at the logjam, but we didn’t wait to find out. If you’re after photos without people then going super early really is your only option. After that it was back over the logjam and back to the car to warm up, change, and find some breakfast! What an amazing start to the day and another item checked off the bucket list! 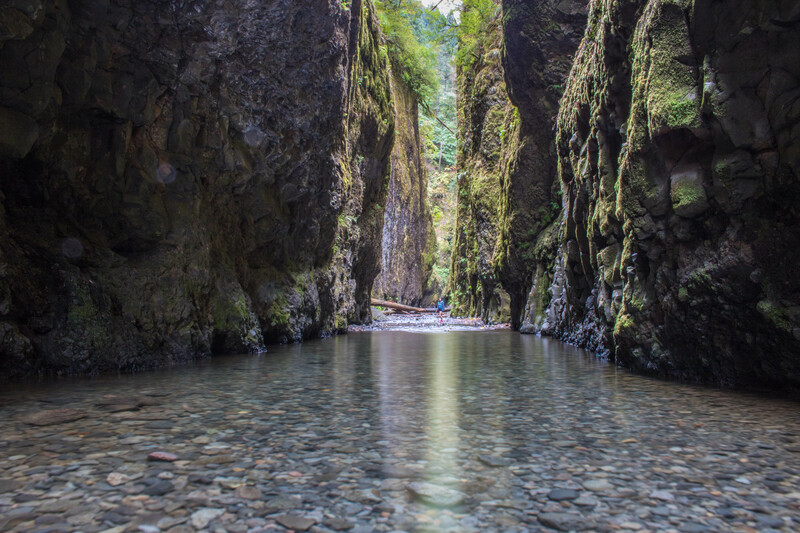 Thank you, Oneonta Gorge, you are stunning! One last giant hurdle before getting to warm up in the car!